This Prospectus Supplement No. 13 (“Prospectus Supplement No. 13”) relates to the Prospectus of Aerkomm Inc., dated May 14, 2018 (the “Prospectus”), relating to the offering (the “Offering”) up to $60,000,000 of shares of our common stock on a best efforts basis as described in the Prospectus, with a minimum offering amount of approximately $5,000,000, and a maximum offering amount of $60,000,000. The price to the public in this offering is $8.50 per share. Boustead Securities, LLC is the underwriter for this offering. This Prospectus Supplement No. 12 should be read in conjunction with the Prospectus and Prospectus Supplement No. 1 filed with the Securities and Exchange Commission on June 20, 2018, Prospectus Supplement No. 2 filed with the Securities and Exchange Commission on June 25, 2018, Prospectus Supplement No. 3 filed with the Securities and Exchange Commission on July 12, 2018, Prospectus Supplement No. 4 filed with the Securities and Exchange Commission on July 30, 2018, Prospectus Supplement No. 5 filed with the Securities and Exchange Commission on August 14, 2018, Prospectus Supplement No. 6 filed with the Securities and Exchange Commission on August 31, 2018, Prospectus Supplement No. 7 filed with the Securities and Exchange Commission on September 5, 2018, Prospectus Supplement No. 8 filed with the Securities and Exchange Commission on September 19, 2018, Prospectus Supplement No. 9 filed with the Securities and Exchange Commission on November 7, 2018, Prospectus Supplement No. 10 filed with the Securities and Exchange Commission on November 16, 2018, Prospectus Supplement No. 11 filed with the Securities and Exchange Commission on December 3, 2018 and Prospectus Supplement No. 12 filed with the Securities and Exchange Commission on December 10, 2018 (collectively, the “Prior Prospectus Supplements”) and is qualified by reference to the Prospectus and the Prior Prospectus Supplements, except to the extent that the information in this Prospectus Supplement No. 13 supersedes the information contained in the Prospectus and the Prior Prospectus Supplements, and may not be delivered without the Prospectus and the Prior Prospectus Supplements. This Prospectus Supplement No. 13 is being filed to include the information set forth in our Current Reports on Form 8-K filed with the Securities and Exchange Commission on December 13, 2018, January 16, 2018 and January 18, 2019. INVESTING IN OUR SECURITIES INVOLVES A HIGH DEGREE OF RISK. YOU SHOULD CAREFULLY READ AND CONSIDER THE “RISK FACTORS” BEGINNING ON PAGE 8 OF THE PROSPECTUS. The date of this Prospectus Supplement No. 13 is January 18, 2019. Indicate by check mark whether the registrant is an emerging growth company as defined in Rule 405 of the Securities Act of 1933 or Rule 12b-2 of the Securities Exchange Act of 1934. Product Purchase Agreement with Republic Engineers Pte. Ltd.
On November 30, 2018, Aircom Telecom LLC (“Aircom Telecom”), a Taiwanese limited liability company and a wholly owned subsidiary of Aircom Pacific, Inc. (“Aircom”), a California corporation and a wholly-owned subsidiary of Aerkomm Inc. (the “Company”) and Republic Engineers Pte. Ltd., a Singapore private limited company (“Republic Engineers”), entered into a Product Purchase Agreement (the “Purchase Agreement”), pursuant to which Republic Engineers has agreed to purchase from Aircom Telecom shipsets of the “AERKOMM®K++” system being developed by Aircom. Each shipset of the AERKOMM®K++ system, embodied and produced by Airbus SAS, will constitute a complete in-flight entertainment and connectivity, or IFEC, solution ready for installation on certain types of Airbus aircraft. Under the terms of the Purchase Agreement, Republic Engineers has committed to purchase a minimum of 10 shipsets of the AERKOMM®K++ system. Republic Engineers has the option to purchase up to 30 additional shipsets, subject to Aircom Telecom’s acceptance of the additional purchase orders. Aircom Telecom expects to commence delivering AERKOMM®K++ system to Republic Engineers in the third quarter of 2019. The foregoing summary of the Purchase Agreement does not purport to be complete and is qualified in its entirety by reference to the full text of the Purchase Agreement in redacted form1, which is attached to this Current Report on Form 8-K as Exhibit 10.1, which exhibit is incorporated by reference into Item 1.01. On December 11, 2018, the Company issued a press release announcing the Purchase Agreement with Republic Engineers. The press release incorrectly refers to Republic Engineers as Republic Engineers Maldives Pvt. Ltd. The press release is attached hereto as Exhibit 99.1 and is being furnished and shall not be deemed “filed” for the purposes of Section 18 of the Securities and Exchange Act of 1934, as amended (the “Exchange Act”), or otherwise subject to the liabilities of that section, nor shall it be deemed incorporated by reference into any filing under the Securities Act of 1933, or the Exchange Act, except as expressly set forth by specific reference in any such filings. 1 Certain confidential information has been omitted from the RE Agreement and filed separately with the Securities and Exchange Commission. Confidential treatment has been requested with respect to this omitted information. 99.1 Press Release of the Registrant dated December 11, 2018 relating to the Agreement between Aircom Telecom LLC and Republic Engineers Pte. Ltd. Date: December 12, 2018 AERKOMM INC. Confidential Information has been omitted from this Agreement and filed separately with the Securities and Exchange Commission. Confidential treatment has been requested with respect to this omitted information. THIS PRODUCT PURCHASE AGREEMENT (this “Agreement”) is entered into as of November 30, 2018, by and between Aircom Telecom LLC, a Taiwan limited liability company having its principal place of business at 1F., No. 13, Ln. 120, Sec. 1 Neihu Rd., Taiwan (“Supplier”), and Republic Engineers Pte. Ltd., a Singapore private limited company having its principal place of business at 63 Ubi Avenue 1, #06-01, Singapore, 408937 (“Buyer”), each a “Party” or collectively, the “Parties”. 1.1 Definitions. Capitalized terms have the meanings set forth or referred to in Exhibit D, unless otherwise defined herein. (c) Clause headings are for convenient reference only and have no effect in limiting or extending the language to which they refer in this Agreement or any Exhibit or Attachment. 2.1 Under the terms of this Agreement, Buyer retains Supplier to provide to Buyer any product set forth in Exhibit A (the “Product”). 2.2 The terms and conditions of any Exhibit are supplemented by the terms and conditions of this Agreement according to the “Order of Precedence” clause of this Agreement. 2.3 All terms and conditions within this Agreement shall govern any Order submitted for Products and all Orders shall reference this Agreement. 3.1 Price. Prices of the Product are listed on the attached Exhibit B Product and Pricing Sheet. Supplier may adjust prices from time to time by delivering to Buyer an amended Product and Pricing Sheet, provided, however, that price adjustments shall not affect the Purchase Orders that have been placed and accepted prior to the delivery of the amended Product and Pricing Sheet. 3.2 Payment Terms. Supplier shall issue an invoice to Buyer on or any time after Supplier accepts a Purchase Order. Buyer shall pay invoiced amounts due to Supplier via wire transfer in accordance with the following payment schedule. All payments hereunder will be in US dollars unless otherwise agreed to in writing. In the event of a payment dispute, Buyer shall deliver a written statement to Supplier no later than ten (10) business days prior to the date payment is due on the disputed invoice, listing all disputed items and providing a reasonably detailed description of each disputed item. Amounts not so disputed are deemed accepted and must be paid, notwithstanding disputes on other items, within the period set forth in this Section 3. The Parties shall seek to resolve all such disputes expeditiously and in good faith. 3.3 Late Payments. Except for the invoiced payments that Buyer has successfully disputed, Buyer shall pay interest on all late payments calculated daily and computed monthly, at the lesser of the rate of five percent (5%) per month or the highest rate permissible under applicable Law. 3.4 Taxes. All prices are exclusive of, and Buyer is solely responsible for, and shall pay all taxes, duties, deductions, charges or fees; provided, however, that Buyer shall not be responsible for any taxes imposed on Supplier’s income, revenues, gross receipts, personnel or real or personal property. 4. ORDER AND PRODUCT ADMINISTRATION. 4.1 Purchase Orders. Buyer shall issue to Supplier Purchase Orders (containing applicable basic order terms that are consistent with the terms of this Agreement). By issuing a Purchase Order, Buyer makes an offer to purchase Products pursuant to the terms and conditions of this Agreement. Any variations made to the terms and conditions of this Agreement by Buyer in any Purchase Orders are void and have no effect. Buyer shall be obligated to purchase from Supplier quantities of Products specified in a Purchase Order. Each Order shall be deemed to be incorporated as part of this Agreement upon Buyer’s issuance thereof. 4.2 Order Placement. Purchase Orders shall be placed by Buyer at least twenty-four (24) months prior to the expected delivery date. Purchase Order pricing shall be consistent with the Product pricing described in Exhibit B, as amended. 4.3 Order Acceptance. Supplier accepts a Purchase Order by confirming the order in writing. Any additional or different terms proposed by Buyer are rejected unless expressly agreed to in writing. 4.4 Order Rejection. Supplier shall have the right to reject an Order without liability or penalty, and without constituting a waiver of any of Supplier’s rights or remedies under this Agreement if the Order does not comply with the requirements of this Agreement. Should Supplier reject an order based upon the foregoing, Supplier will notify Buyer in writing of such rejection. 4.5 Minimum Order Quantity. Buyer commits to place binding Orders with Supplier, upon Effective Date, for a Minimum Order Quantity (“MOQ”) of Product as follows. Buyer shall issue to Supplier Purchase Orders for the MOQ within thirty (30) days from the Effective Date. 5.1 Delivery. Supplier shall deliver the Products to FCA Oakland, California (Incoterms 2010), using Supplier’s standard methods for packaging and shipping such Products. Unless otherwise directed, all Products shipped in one (1) day from and to a single location may be consolidated on one (1) bill of lading or air waybill, as appropriate. 1 Confidential Information has been omitted from this Agreement and filed separately with the Securities and Exchange Commission. Confidential treatment has been requested with respect to this omitted information. 5.2 Title and Risk of Loss. Title to Products passes to Buyer upon full payment of the Products by Buyer. Risk of loss passes to Buyer upon shipment of Products to the carrier in accordance with Section 5.1. (a) Following each delivery of Products by the Supplier, Buyer may conduct inspection within thirty (30) days after delivery of the Product (“Inspection Period”) to determined whether the Product was delivered in conformance with the requirements of this Agreement. If Buyer does not notify Supplier in writing of any non-conformities within the Inspection Period, Buyer shall be deemed to have accepted the Product. Subject to written notification within the Inspection Period, Buyer may reject any Product that does not materially conform with the requirements identified in the applicable Order. If Supplier determines such rejected Products are nonconforming, Supplier shall, in its sole discretion, either (a) replace such nonconforming Products with conforming Products; or (b) refund to Buyer such amount paid by Buyer for the nonconforming Products returned to Supplier. Except as provided under this Section 5.3(a), Buyer has no right to return Products shipping to Buyer pursuant to this Agreement. (b) THE REMEDIES SET FORTH IN THIS SECTION 5.3 ARE BUYER’S SOLE AND EXCLUSIVE REMEDY AND SUPPLIER’S ENTIRE LIABILITY AND OBLIGATION FOR ANY NON-CONFORMITIES COVERED BY THIS SECTION. 5.4 Export License. The Products under this Agreement may be subject to the export laws and regulations of the United States and other jurisdictions. Supplier will comply with such laws and regulations and will not export, re-export or otherwise transfer any such Products without obtaining required governmental authorizations or licenses; provided, however, that Buyer shall provide Supplier with such information and assistance as may reasonably be required by Supplier in connection with securing such authorizations or licenses, and shall take timely action to obtain all required supporting documentation. 5.5 Country of Origin. All Products and/or their packaging and export documents, unless specifically exempted by the destination country’s governing authorities, must be marked with the country of origin (manufacture) of the Products in a conspicuous place as legibly, indelibly, and permanently as the nature of the article or container permits. 5.6 Shipping Documents. After Supplier delivers the Products to the carrier, Supplier will send, upon request by Buyer, shipping documents including the commercial invoice, packing list, and air waybill or three original parts of the combined through bill of lading, clean without notation, necessary to release the Products to Buyer’s custody. 5.7 Delivery Time. The Parties acknowledge that any time quoted for delivery is an estimate only. However, Supplier shall use commercially reasonable efforts to deliver all Products on or before the requested delivery date. No delay in the shipment or delivery of any Product relieves Buyer of its obligations under this Agreement, including accepting delivery of any remaining installment or other orders of Products. 6. CONFIDENTIALITY. The terms of this Agreement are deemed to be Confidential Information under the Non-Disclosure Agreement between Supplier’s parent company, Aircom Pacific, Inc. and Republic Engineers Pte. Ltd., effective as of January 26, 2018 (the “NDA”). The NDA is incorporated herein and will continued to govern Confidential Information exchanged during the term of this Agreement. If there is any conflict between the provisions of the NDA and this Agreement, this Agreement will govern. Those provisions of the NDA that are stated to survive termination, will survive termination of this Agreement. 7.1 Term. The term of this Agreement commences on the Effective Date and continues for a period of five (5) years, unless it is terminated earlier pursuant to the terms of this Agreement or applicable Law (“Term”). (a) Supplier may terminate this Agreement immediately upon notice to Buyer in the event Supplier provides written notice to Buyer that Buyer failed to pay an undisputed invoice in accordance with Section 3 and Buyer fails to pay the undisputed amounts due within thirty (30) days from receipt of such notice. (b) Buyer may terminate this Agreement immediately upon notice to Supplier in the event Buyer provides written notice to Supplier that Supplier materially breaches any of its obligations under this Agreement and Supplier fails to cure such breach within ninety (90) days from receipt of such notice; provided, however that Buyer shall pay all amounts due to Supplier for Products delivered (or not yet delivered but committed under MOQ), and reimburse Supplier for all of its out-of-pocket costs and expenses incurred by Supplier prior to Supplier’s receipt of the termination notice. (c) Either Party may terminate this agreement, immediately upon written notice to the other Party, in the event the other Party: (i) becomes insolvent; (ii) makes an assignment for the benefit of creditors; (iii) files a voluntary bankruptcy petition; (iv) acquiesces to an involuntary bankruptcy petition; (v) is adjudicated bankrupt; or (vi) after two (2) consecutive weeks following a Force Majeure Event that impacts the affected Party’s obligations under this Agreement. (d) Termination of this Agreement will not be exclusive of any other remedy available under this Agreement or applicable law or equity. (e) The Parties have considered the investment required to perform this Agreement and possible losses in the event of termination, and agree the rights of termination provided in this Agreement are absolute. (a) Supplier will issue to Buyer a final invoice including all fees and charges for Products and expenses incurred prior to and including the effective date of termination, and Buyer shall pay such invoice in accordance with Section 3. (b) Upon Buyer’s compliance with its obligations pursuant to Section 7.2(b), Supplier shall deliver all ordered Products to Buyer. 8. PRODUCT WARRANTIES. The Product warranty and out of warranty Product repairs are set forth in Exhibit C – Product Warranty and Support Terms. (d) Any Products infringe any Intellectual Property Rights of a third party. Without limiting the generality of the foregoing, if any of the Products or any portion thereof is held, or in Supplier’s reasonable opinion is likely to be held, in any such suit to constitute an infringement, misappropriation or violation of the rights of a third party, Supplier shall promptly, at its expense and option, either: (i) secure for Buyer the right to continue the use of such Product; or (ii) modify or replace such Product with a substantially equivalent item that is not subject to any such claim, or modify such Product so that it becomes no longer subject to any such claim; provided, however, that after any such replacement or modification, the Product must continue to substantially conform to the specifications provided by Buyer, and further provided, that any such modified or replaced Product shall be subject to all Supplier warranties contained herein. If Supplier is unable to procure the right to continued use of such Product, or to modify or replace such Product, then Buyer shall return such Product to Supplier, and Supplier shall refund to Buyer the amount paid to Supplier for such Products. THIS SECTION 10.1 SETS FORTH BUYER’S SOLE AND EXCLUSIVE REMEDY AND SUPPLIER’S ENTIRE LIABILITY AND OBLIGATION FOR ANY PRODUCTS THAT ARE WITHDRAWN PURSUANT TO THIS SECTION. (e) Any products or assemblies manufactured or designed by Buyer. 9.3 Indemnification Procedures. After receipt of a notice of any Claim or the commencement of any action, an Indemnified Party shall: (a) notify the Indemnifying Party in writing of any such Claim; (b) provide the Indemnifying Party with reasonable assistance to settle or defend such Claim, at the Indemnifying party’s own expense; and (c) grant to the Indemnifying Party the right to control the defense and/or settlement of such Claim, at the Indemnifying Party’s own expense; provided, however, that: (i) Indemnifying Party shall not, without the Indemnified Party’s consent (such consent not to be unreasonably withheld or delayed), agree to any settlement that makes any admission on behalf of the Indemnified Party; and (ii) the Indemnified Party shall have the right, at its own expense, to monitor any legal proceeding through legal counsel of its choosing. 9.4 EXCLUSIVE REMEDY. THIS SECTION SETS FORTH THE ENTIRE LIABILITY AND OBLIGATION OF EACH INDEMNIFYING PARTY AND THE SOLE AND EXCLUSIVE REMEDY FOR EACH INDEMNIFIED PARTY FOR ANY LOSSES COVERED BY THIS SECTION 10. 10.1 No liability for Consequential or Indirect Damages. IN NO EVENT SHALL EITHER PARTY OR ITS REPRESENTATIVES BE LIABLE FOR CONSEQUENTIAL, INDIRECT, INCIDENTAL, SPECIAL, EXEMPLARY, PUNITIVE OR ENHANCED DAMAGES, LOST PROFITS OR REVENUES OR DIMINUTION IN VALUE, ARISING OUT OF OR RELATING TO ANY BREACH OF THIS AGREEMENT, REGARDLESS OF (A) WHETHER SUCH DAMAGES WERE FORESEEABLE, (B) WHETHER OR NOT THE PARTY WAS ADVISED OF THE POSSIBILITY OF SUCH DAMAGES AND/OR (C) ANY LEGAL OR EQUITABLE THEORY (CONTRACT, TORT OR OTHERWISE) UPON WHICH THE CLAIM IS BASED, AND NOTWITHSTANDING THE FAILURE OF ANY AGREED OR OTHER REMEDY OF ITS ESSENTIAL PURPOSE. 10.2 Maximum Liability. IN NO EVENT SHALL EACH PARTY’S AGGREGATE LIABILITY ARISING OUT OF OR RELATED TO THIS AGREEMENT, WHETHER ARISING OUT OF OR RELATED TO BREACH OF CONTRACT, TORT (INCLUDING NEGLIGENCE) OR OTHERWISE, EXCEED THE TOTAL AMOUNTS PAID AND AMOUNTS ACCRUED BUT NOT YET PAID TO SUPPLIER PURSUANT TO THIS AGREEMENT IN THE TWELVE (12) MONTH PERIOD PRECEDING THE EVENT GIVING RISE TO THE CLAIM. (f) Buyer shall use Supplier Intellectual Property Rights only in accordance with this Agreement and any instructions of Supplier. 11.3 Pre-Existing Intellectual Property. Unless as otherwise agreed to in writing by the Parties, each Party will retain its Intellectual Property Rights that pre-exist the Effective Date or were obtained outside of this Agreement. (c) The Products will materially comply with the specifications for such Products set forth in Exhibit A. (d) All financial information that it has provided to Supplier is true and accurate and fairly represents Buyer’s financial condition; and the execution of this Agreement by its Authorized Representative, and the delivery of this Agreement by Buyer, have been duly authorized by all necessary corporate action on the part of the Buyer. EXCEPT AS SET FORTH IN THIS SECTION, (A) NEITHER SUPPLIER NOR ANY PERSON ON SUPPLIER’S BEHALF HAS MADE OR MAKES ANY EXPRESS OR IMPLIED REPRESENTATION OR WARRANTY WHATSOEVER, EITHER ORAL OR WRITTEN, INCLUDING ANY WARRANTIES OF MERCHANTABILITY, FITNESS FOR A PARTICULAR PURPOSE, TITLE, NON-INFRINGEMENT OR PERFORMANCE OF GOODS OR PRODUCTS TO STANDARDS SPECIFIC TO THE COUNTRY OF IMPORT, WHETHER ARISING BY LAW, COURSE OF DEALING, COURSE OF PERFORMANCE, USAGE OF TRADE OR OTHERWISE, ALL OF WHICH ARE EXPRESSLY DISCLAIMED, AND (B) BUYER ACKNOWLEDGES THAT IT HAS NOT RELIED UPON ANY REPRESENTATION OR WARRANTY MADE BY SUPPLIER, OR ANY OTHER PERSON ON SUPPLIER’S BEHALF, EXCEPT AS SPECIFICALLY PROVIDED IN THIS SECTION OF THE AGREEMENT. 13.1 Language. The Parties hereto have agreed that this Agreement be drafted in English only. All contractual documents and all correspondence, invoices, notices and other documents shall be submitted in English. 13.2 No Assignment. Neither Party may assign or transfer its rights or obligations in this agreement (by operation of law or otherwise), in whole or in part, to any person or entity without the prior written consent of the other Party, which consent shall not be unreasonable withheld; provided, however, that either party may assign such rights or obligations to (a) a successor or surviving corporation resulting from a merger, consolidation, sale of assets or stock or other corporate reorganization, or (b) its parent or affiliate, upon condition that the assignee will assume all of the Party’s obligations hereunder. Any attempt to assign or delegate in violation of this clause will be void. 13.3 Severability. If any provision of this Agreement is found to be invalid, illegal, or unenforceable in any respect, the remaining provisions of this Agreement will remain in full force and effect. 13.4 Notices. Each Party must provide notices or other communications to the other Party in writing by: (a) certified mail, hand delivery or delivery by a courier service to the address below set forth (or such other address as may have been furnished by or on behalf of such party by like notice), (b) facsimile with receipt of a “transmission ok” acknowledgement, or (c) e-mail with a read receipt. Communications sent by facsimile or e-mail shall be deemed effectively served upon dispatch, if receipt is confirmed electronically. Communications sent by certified mail or courier service shall be deemed effectively served three (3) calendar days after deposit. All other general correspondence may be communicated by electronic means (e-mail). 63 Ubi Avenue 1, #06-01 1F., No. 13, Ln. 120, Sec. 1 Neihu Rd. 13.5 No Waiver. No waiver by either Party of a breach of any term, provision or condition of this Agreement by the other Party shall constitute a waiver of any prior, concurrent or subsequent breach of the same or any other provision, and no waiver will be binding unless made in an express writing signed by the waiving Party. 13.6 Counterparts. This Agreement may be executed in counterparts, each of which shall be deemed an original, and all of such counterparts together shall constitute one and the same instrument binding on both parties. Facsimile or electronically authenticated signatures will be considered binding for all purposes. 13.7 Headings. The section and subsection headings used in this Agreement are intended for reference purposes only and shall not affect the interpretation or construction of any provision of this Agreement. 13.8 Governing Law, Venue. This Agreement shall be governed by, and construed in accordance with, the laws of California, without regard to its conflicts of laws provisions. The Parties agree that the United Nations Convention on Contracts for the International Sale of Goods does not apply to this Agreement. Each Party irrevocably and unconditionally submits to the exclusive jurisdiction of such courts and agrees to bring any such action, litigation or proceeding arising in connection with this Agreement only in the courts of California. If for any reason venue is not accepted in California, the Parties irrevocably consent as provided in this Section to the exclusive jurisdiction of the courts of Taiwan. Each Party agrees that a final judgment in any such action, litigation or proceeding is conclusive and may be enforced in other jurisdictions by suit on the judgment or in any other manner provided by law. 13.9 Relationship of the Parties. The Parties are independent contractors. Nothing in this Agreement shall be construed to create or imply partnership, joint venture, agency relationship or contract of employment. Neither Party has the right to incur any obligation on behalf of the other Party. 13.10 Force Majeure. Supplier shall not be liable or responsible to Buyer, nor be deemed to have defaulted under or breached this Agreement, for any failure or delay in fulfilling or performing any term of this Agreement, if such failure or delay is caused by or results from acts beyond Supplier’s control, including: (a) acts of nature; (b) flood, fire, earthquake or explosion; (c) war, invasion, hostilities (whether war is declared or not), terrorist threats or acts, riot or other civil unrest; (d) requirements of law; (e) actions, embargoes or blockades in effect on or after the date of this Agreement; (f) action by any governmental authority (whether or not having the effect of law); (g) national or regional emergency; (h) strikes, labor stoppages or slowdowns or other industrial disturbances; (i) shortages of or delays in receiving raw materials; or (j) shortage of adequate power or transportation facilities (each, a “Force Majeure Event”). Supplier shall use its best efforts to notify Buyer within three (3) days after the occurrence of such Force Majeure event, and the cessation thereof. 13.11 Press Releases. Neither party shall issue any press release concerning this Agreement without the other Party’s consent. Neither party may use the name, trade name, trademark, logo, acronym or other designation of the other in connection with any press release, advertising, publicity materials or otherwise without the prior written consent of the other Party. 13.12 Order of Precedence. Any inconsistency in the provisions of this Agreement will be resolved by giving precedence in the following order: (1) The applicable Amendment that gives rise to the inconsistency in provisions, (2) this Agreement, (3) Exhibits, and (4) any other document incorporated by express reference as part of the Agreement; such that the provision in the higher ranked document, to the extent of the inconsistency, will prevail. 13.13 Entire Agreement. This Agreement contains the entire agreement between the Parties with respect the supply of Products to Buyer and Product Support and supersedes any prior and contemporaneous representations or agreements, oral or written, and all other communications between the Parties relating to the supply of Products to Buyer and Product Support. This Agreement may not be altered or modified without the express written consent of all Parties. 14. PERSONAL GUARANTEE. Pursuant to a separate agreement executed as of the Effective Date, Chinniah Ahnandaraja has absolutely, unconditionally, and irrevocably guaranteed all obligations of the Buyer to Supplier pursuant to this Agreement, and Supplier shall have no obligations hereunder unless and until such Guaranty Agreement has been duly executed by Chinniah Ahnandaraja and delivered to Supplier. IN WITNESS WHEREOF the Parties hereto, by their duly Authorized Representatives, have executed this Agreement as of the date first set forth above. AIRCOM TELECOM LLC REPUBLIC ENGINEERS PTE. LTD. The Product is defined as the Aerkomm K++ System (“Product”), which is comprised of the following parts as well as supporting documentation. Together in the quantities identified in the parts list below, they comprise one shipset (the “Shipset”). 2 Confidential Information has been omitted from this Agreement and filed separately with the Securities and Exchange Commission. Confidential treatment has been requested with respect to this omitted information. The price listed below is a firm fixed price for the initial (5) years from the Effective Date of this Agreement and is valid for Purchase Orders for the MOQ and an optional additional 30 Shipsets. 3 Confidential Information has been omitted from this Agreement and filed separately with the Securities and Exchange Commission. Confidential treatment has been requested with respect to this omitted information. d) for airborne equipment, Supplier shall attach the necessary airworthiness Certification document(s) to permit installation of the Product on to an aircraft in accordance with the latest revision of the airworthiness regulations applicable for the importing country. The Certification document(s) shall show the configuration / modification status of each Product. c) has been used with any third-party Products, hardware or product that has not been previously approved in writing by Supplier. 3) WARRANTY PERIOD. Supplier will provide the remedies set forth in Section 4 below, if a Product fails to comply in any respect with the warranty set forth in Section 1 of this Exhibit C during the applicable Warranty Period. i) As to a defect in material or workmanship or conformance to the Order, a repair will be free of such defects for the remainder of the initial Warranty Period set forth in the Agreement or for period of ninety (90) days from the date of return shipment of the repaired Product by Supplier to Buyer, whichever ends later. ii) Buyer shall notify Supplier, in writing, of any alleged claim or defect within ten (10) business days from the date Buyer discovers, or upon reasonable inspection should have discovered, such alleged claim or defect (but in any event before the expiration of the initial Warranty Period). iii) Buyer shall arrange for the return of such defective Product pursuant to the Return Material Authorization (“RMA”) number to be obtained by contacting Supplier, and ship at its expense and risk of loss, such Products to Supplier’s premises for inspection and testing by Supplier. iv) if Supplier’s inspection and testing reveals that such Products are defective and any such defect has not been caused or contributed to by any of the factors described under Section 2 above, Supplier shall in its sole discretion and at its expense, repair or replace such defective Products. vi) except for the NFF Products, Supplier shall ship to Buyer, at Supplier’s expense and risk of loss, the repaired or replaced Products to a location designated by Buyer. In no event shall Buyer or its Customers reconstruct, repair, alter or replace any Product, in whole or in part, either itself or by or through any third party. SUBJECT TO SECTION 11.1 OF THE AGREEMENT AND SECTION 2 OF THIS EXHIBIT C, THIS SECTION 4 OF EXHIBIT C SETS FORTH BUYER’S SOLE REMEDY AND SUPPLIER’S ENTIRE LIABILITY UNDER THE AGREEMENT OR THE PSA FOR ANY BREACH OF THE PRODUCT WARRANTY SET FORTH IN SECTION 1 ABOVE. b) Turnaround Time. Turnaround Time (“TAT”) for above repairs begins on the date that Supplier receives the Product, and ends on the date the repaired Product is available for shipment. Supplier’s TAT will be on average thirty (30) business days. Affiliate. The term “Affiliate” means an entity, which directly or indirectly, owns or controls, is owned or is controlled by or is under common ownership or control with, another entity. “Control” means the power to direct the management or affairs of an entity, and “ownership” means the beneficial ownership of more than 50% of the voting equity securities or other equivalent voting interests of the entity. Amendment. The term “Amendment” means any modification, addition to, or deletion of the terms and conditions of this Agreement, or any Exhibit, that is executed by an Authorized Representative of each Party and incorporated by reference herein. Authorized Representative. The term “Authorized Representative” means an individual with authority to legally bind the Party. Aviation Authority. The term “Aviation Authority” means the FAA, European Aviation Safety Agency (“EASA”), Australian Civil Aviation Safety Authority (“CASA”), or any other regional aviation authority exercising the same or substantially the same jurisdiction or authority within their respective region. Certification. The term “Certification” means providing an FAA 8130-3 tag, CAAC, or EASA or equivalent documentation. Change. The term “Change” means any change, Amendment and/or modification to the Product which modifies the. form, fit or function of the Product based on a change introduced by: (1) Buyer, requiring a change in the Product Design specified in the Technical Requirements; (2) Supplier requesting a change in the Product Design in the · Technical Requirements; and (3) a change in Law or Regulation or new interpretation of existing Law or Regulation (“Change in Regulation”) issued by the Aviation Authority having jurisdiction over the Product and requiring mandatory changes to Product Design. Claim. The term “Claim” means any claim, action, cause of action, demand, lawsuit, arbitration, inquiry, audit, notice of violation, proceeding, litigation, citation, summons, subpoena or investigation of any nature, civil, criminal, administrative, regulatory or other, whether at law, in equity or otherwise brought against a Person entitled to indemnification under Section 10. Data. The term “Data” means the information contained, conveyed or embodied in Materials such as manuals, instructions, computer files (including Loadable Software), provisioning files, indexes, catalogs, drawings or service bulletins. Exhibit. The term “Exhibit” means any transaction document (whether or not identified as an Exhibit) in which each project outline agreed to by Supplier and Buyer in accordance with the terms and conditions of this Agreement, and preferably in the form attached hereto as Exhibit A. Both Exhibits and Statements of Work shall be executed by the parties and shall form a part of this Agreement. Governmental Authority. The term “Governmental Authority” means any federal, state, local or foreign government or political subdivision thereof, or any agency or instrumentality of such government or political subdivision, or any arbitrator, court or tribunal of competent jurisdiction. Intellectual Property Rights. The term “Intellectual Property Rights” means all industrial and other intellectual property rights comprising or relating to: (a) patents; (b) trademarks; (c) internet domain names, whether or not trademarks, registered by any authorized private registrar or Governmental Authority, web addresses, web pages, website and URLs; (d) works of authorship, expressions, designs and design registrations, whether or not copyrightable, including copyrights and copyrightable works, software and firmware, data, data files, and databases and other specifications and documentation; (e) trade secrets; and (f) all industrial and other intellectual property rights, and all rights, interests and protections that are associated with, equivalent or similar to, or required for the exercise of, any of the foregoing, however arising, in each case whether registered or unregistered and including all registrations and applications for, and renewals or extensions of, such rights or forms of protection pursuant to the Laws of any jurisdiction throughout in any part of the world. Law. The term “Law” means any statute, law, ordinance, regulation, rule, code, constitution, treaty, common law, governmental order or other requirement or rule of law of any Governmental Authority. Notice. The term “Notice” means Buyer’s written notification to Supplier of an alleged defect in Supplier’s Product to establish rights to warranty remedies for all affected, in-warranty Products, from the date such notice is received by Supplier until the claimed defect is Corrected. Order(s). The term “Order(s)” means a Purchase Order and/or Repair Order. Person. The term “Person” means any individual, partnership, corporation, trust, limited liability entity, unincorporated organization, association, Governmental Authority or any other entity. Purchase Order. The term “Purchase Order” means Buyer’s purchase order issued to Supplier under the Agreement, including all terms and conditions attached to, or incorporated into, such purchase order. Repair. The term “Repair” means to make a Product serviceable by replacing or modifying failed or damaged parts, according to Supplier’s maintenance manual. Services. The term “Services” means certain strategic project services, support services and other services that shall, from time to time, be rendered by Supplier for Buyer pursuant to an Exhibit. Spare Part(s). The term “Spare Part(s)” means any Product intended to be used as a replacement Product for installation in an aircraft or for the support of an aircraft. Specification. The term “Specification” means specifications for Services and Products to be provided in an Exhibit or Statement of Work. Supplier Intellectual Property Rights. The term “Supplier Intellectual Property Rights” means Intellectual Property that originated, is made, invented, developed, created, conceived, reduced to practice or purchased by Supplier at its own expense prior to the Effective Date or during the Term of the Agreement and the Supplier has the necessary rights to use or sublicense under this Agreement. Warranty Period. The term “Warranty Period” means that the Supplier warrants to Buyer that all Products provided hereunder shall be under warranty for a period of three (3) years after shipment from Supplier. FREMONT, Calif., Dec 11, 2018 /PRNewswire/ -- Aerkomm Inc. (“Aerkomm” or “the Company”) (AKOM), a provider of in-flight broadband entertainment and connectivity solutions, today announced that its wholly owned subsidiary, Aircom Telecom LLC (“Aircom Telecom”), has entered into a product purchase agreement with Republic Engineers Maldives Pte. Ltd. (“Republic Engineers”), a Singapore based, private construction and contracting company with close relationships to Asian airlines based in Singapore. Under the agreement, Republic Engineers has committed to purchase a minimum of 10 shipsets of the AERKOMM®K++ in-flight entertainment and connectivity (“IFEC”) system with an option to purchase an additional 30 shipsets. Delivery of the first AERKOMM®K++ system to Republic Engineers is expected to begin in the third quarter of 2019. More details about this agreement can be found in the Company’s filings with the U.S. Securities and Exchange Commission. Aerkomm Inc. (OTCQX: AKOM), operating through its wholly owned subsidiary, Aircom Pacific, Inc., is a development stage service provider of in-flight entertainment and connectivity, or IFEC, solutions for the airline industry. The Company strives to become a leading provider of a wide range of in-flight broadband entertainment and connectivity services, including Wi-Fi connectivity, cellular networks, movies, gaming, live television, and music. Aerkomm aims to reshape the market for in-flight entertainment and connectivity services by offering on-board connectivity to its prospective airline partners and passengers for free, generating revenue through advertising and on-board transactions. More information about Aerkomm is available at www.aerkomm.com. This release does not constitute an offer to sell or a solicitation of offers to buy any securities of any entity. This release contains certain forward-looking statements based on our current expectations, forecasts and assumptions that involve risks and uncertainties. Forward-looking statements in this release are based on information available to us as of the date hereof. Our actual results may differ materially from those stated or implied in such forward-looking statements, due to risks and uncertainties associated with our business, which include the risk factors disclosed in our Registration Statement on Form S-1 filed with the Securities and Exchange Commission (SEC File No. 333-222208) on December 20, 2017, as declared effective on May 7, 2018 and supplemented to date. Forward-looking statements include statements regarding our expectations, beliefs, intentions or strategies regarding the future and can be identified by forward-looking words such as “anticipate,” “believe,” “could,” “estimate,” “expect,” “intend,” “may,” “should,” and “would” or similar words. We assume no obligation to update the information included in this press release, whether as a result of new information, future events or otherwise. Indicate by check mark whether the registrant is an emerging growth company as defined in Rule 405 of the Securities Act of 1933 (17 CFR §230.405) or Rule 12b-2 of the Securities Exchange Act of 1934 (17 CFR §240.12b-2). On January 16, 2019, Aerkomm Inc. (the “Company”) completed a 1-for-5 reverse split of the Company’s issued and outstanding shares of common stock (the “Reverse Split”), which was completed by the filing of a Certificate of Change Pursuant to NRS 78.209 (the “Certificate of Change”) with the Nevada Secretary of State on December 26, 2018. The Reverse Split was duly approved by the Board of Directors of the Company without stockholder approval, in accordance with the authority conferred by Section 78.207 of the Nevada Revised Statutes. 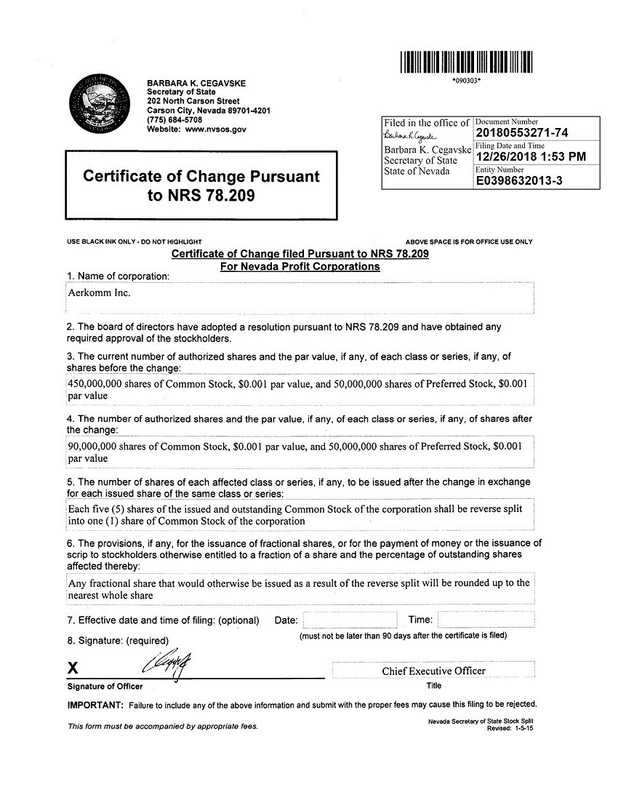 The Certificate of Change also decreased the authorized number of shares of the Company’s common stock from 450,000,000 shares to 90,000,000 shares. Pursuant to the Reverse Split, holders of the Company’s common stock are deemed to hold one (1) post-split share of the Company’s common stock for every five (5) shares of the Company’s common stock held. No fractional shares were issued in connection with the Reverse Split. Stockholders who entitled to a fractional post-split share received in lieu thereof one (1) whole post-split share. At the market opening on January 16, 2019, the Company’s common stock began trading on the OTCQX Market on a split-adjusted basis. The Company’s common stock will continue to trade under the symbol “AKOM” (temporary symbol “AKOMD” indicating a reverse stock split has occurred). The new CUSIP number for the Company’s common stock is 00774B 208. Following the effectiveness of the Reverse Split, the Company has 9,351,666 shares of common stock issued and outstanding. Date: January 16, 2019 AERKOMM INC.
As previously disclosed, on January 16, 2019, Aerkomm Inc. (the “Company”) completed a 1-for-5 reverse split of the Company’s issued and outstanding shares of common stock (the “Reverse Split”), which was completed by the filing of a Certificate of Change Pursuant to NRS 78.209 with the Nevada Secretary of State on December 26, 2018. On January 17, 2019, the Company issued a press release announcing the Reverse Split, a copy of which is filed herewith as Exhibit 99.1. Date: January 18, 2019 AERKOMM INC.
FREMONT, Calif., Jan. 17, 2019 /PRNewswire/ -- Aerkomm Inc. (“Aerkomm” or “the Company”) (OTCQX: AKOM), a provider of in-flight broadband entertainment and connectivity solutions, today announced that the Company has completed a 1-for-5 reverse stock split of its issued and outstanding shares of common stock (the “Reverse Split”). Pursuant to the Reverse Split, holders of the Company’s common stock are deemed to hold one (1) post-split share of the Company’s common stock for every five (5) shares of the Company’s common stock held. No fractional shares were issued in connection with the Reverse Split. Stockholders who were entitled to a fractional post-split share received in lieu thereof one (1) whole post-split share. More details about the reverse stock split can be found in the Company’s filing with the Securities and Exchange Commission. Aerkomm Inc. (OTCQX: AKOM), operating through its wholly owned subsidiary, Aircom Pacific, Inc., is a development stage service provider of in-flight entertainment and connectivity solutions for the airline industry. The Company strives to become a leading provider of a wide range of in-flight broadband entertainment and connectivity services, including Wi-Fi connectivity, cellular networks, movies, gaming, live television, and music. Aerkomm aims to reshape the market for in-flight entertainment and connectivity services by offering on-board connectivity to its prospective airline partners and passengers for free, generating revenue through advertising and on-board transactions.